Floodwater left by hurricanes could boost the local population of mosquitoes, some of which carry dangerous diseases. Irma, the strongest hurricane ever to form in the Atlantic, will leave a lot of devastation in her path. Part of that destruction will come from storm surge, rainfall and flooding — and that water is the perfect breeding ground for mosquitoes. Mosquito eggs need water to hatch. Some species require standing water, but others prefer floodwater. Irma is likely to provide plenty of both. At best, mosquitoes are just a nuisance, but they can also carry dangerous and even deadly diseases. And the bugs thrive in Florida. The state is warm and wet, and the southern part of the state, where Irma hit first, is home to the Everglades, a huge swamp. Mosquitoes in the state carry at least nine different diseases including Zika, malaria and West Nile virus. Parts of Florida, like Miami, are incredibly prone to high water. Rising sea levels have caused a phenomenon called "sunny day" flooding, where the high tide can cause floods. In recent years Miami has been working to raise its streets and install other defenses against the rising ocean. And Miami is already having a bad mosquito season. Storms in July blew in billions of the insects from the Everglades. People of Florida will likely have time to prepare for any mosquito invasion Hurricane Irma brings. 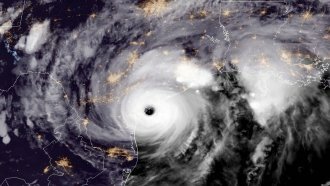 After Hurricane Katrina, researchers expected to see a boom in certain mosquito-borne illnesses, but they found the high winds and storm surge actually washed most mosquitoes away. But a year later, scientists saw a two-fold increase in West Nile Virus incidence in the areas that were flooded during Katrina. Texas is already prepping for potential mosquito problems from Hurricane Harvey. One expert told The Atlantic the mosquito population that was washed away by the storm could come back this year. There is some good news: The Centers for Disease Control and Prevention says people are most likely to see nuisance mosquitoes after these storms, not the disease-carrying ones.